Gemini Jets Models: one limited edition collectible, die cast airliner model, in a 1/400th scale of an Airbus ATR-72-202 in the British Airways Mainline Union Jack Colors Scheme. With titles United Kingdom. Airframe Registration G-BWTL. The model is constructed of metal with some plastic parts. This product was released in November, 2011. 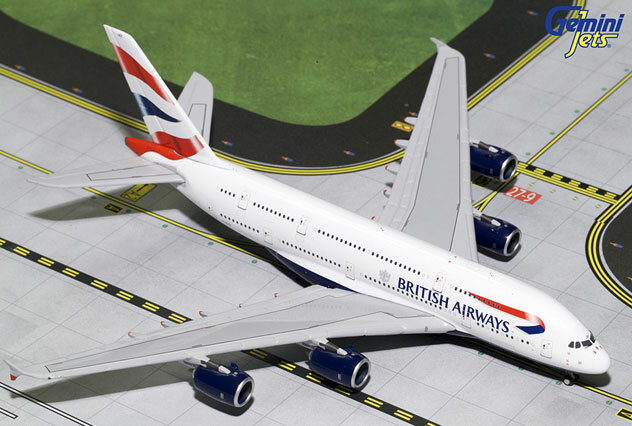 Gemini Jets Models: one limited edition collectible, fully assembled, and highly detailed die cast airliner model, in a 1/400th scale of a Boeing B747-436 in the British Airways Current Union Jack Colors Scheme. Airframe Registration G-BY-GF. The model is constructed of die-cast metal with some plastic parts. This is a collectable model, not suitable for children under the age of 14 years. This product was first released in March, 2019. 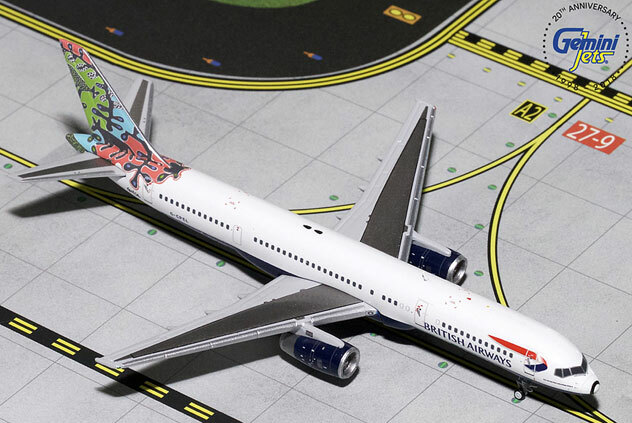 Gemini Jets Models: one limited edition collectible, die cast airliner model, in a 1/400th scale of a Boeing B757-236 in the British Airways Old Botswana World Tails Animals & Trees Colors Scheme. Airframe Registration G-CPEL. The model is constructed of metal with some plastic parts. This product was released in October, 2018. 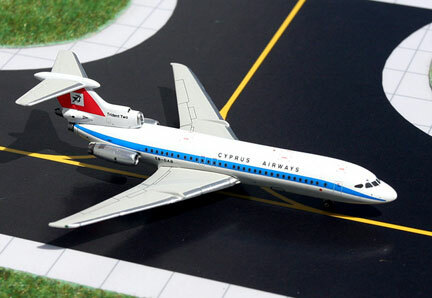 Gemini Jets Model: one limited edition, collectible die cast airliner model in 1/400 scale. All construction is made of metal, of an Boeing B777-236/ER in the British Airways Current USA World Tail. Airframe Registration, G-VIIA. This models is available as December, 2006. 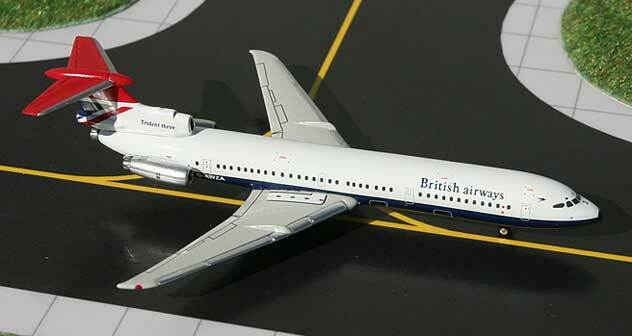 Gemini Jets Model: one limited edition, collectible die cast airliner model in 1/400 scale. All construction is made of metal, of an Boeing B777-236/ER in the British Airways Denmark World Tail. Airframe Registration, G-VIIL. This models is available as January, 2007. 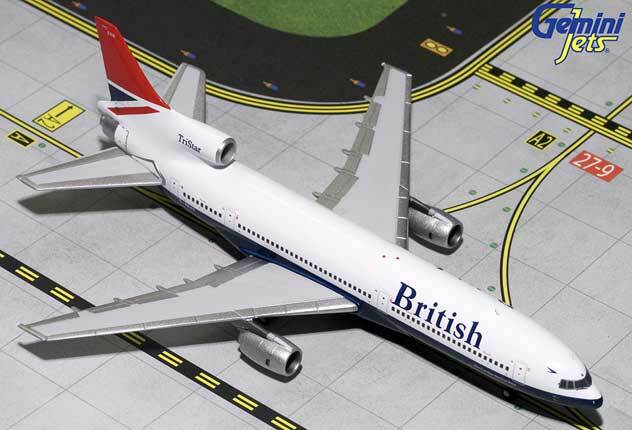 Gemini Jets Models: one limited edition collectable, die-cast airliner model in a 1/400th scale of a Boeing B787-8 Dreamliner in the British Airways Current Union Flag Colors. Airframe Registration G-ZBJA. This model is constructed of die-cast metal with some plastic parts. This product is available beginning in October, 2013. 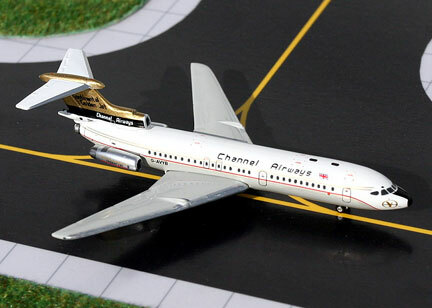 Gemini Jets Model: one limited edition, collectible die cast airliner model in 1/400 scale. All construction is made of metal, of an Hawker Siddeley HS-121 Trident 2E in the British Airways Old Late 1970's RED Tail Colors. Airframe Registration, G-AVFE. This models is available as May, 2007. Gemini Jets Models: one limited edition collectible, die cast airliner model, in a 1/400th scale of a Hawker Siddeley Trident 3B in the British Airways Old 1970’s Red Tail Colors Scheme. Airframe Registration G-AWZA. The model is constructed of metal with some plastic parts. This product was released in January, 2007. Gemini Jets Models: one limited edition collectible, fully assembled, and highly detailed die cast airliner model, in a 1/400th scale of a Lockheed L-1011-385-1 TriStar 1 in the British Airways Old 1970’s Red Tail Negus Colors Scheme. With titles The Caroline Dawtson Rose. Airframe Registration G-BBAG. The model is constructed of die-cast metal with some plastic parts. This is a collectable model, not suitable for children under the age of 14 years. This product was first released in February, 2019. 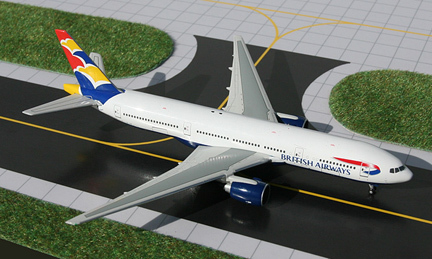 Gemini Jets Models: one limited edition collectible, fully assembled, and highly detailed die cast airliner model, in a 1/400th scale of a Lockheed L-1011-385-1 TriStar 1 in the British Airways Old 1980’s Landor Colors Scheme. With titles Babbacombe Bay. Airframe Registration G-BBAF. The model is constructed of die-cast metal with some plastic parts. This is a collectable model, not suitable for children under the age of 14 years. This product was first released in March, 2019. 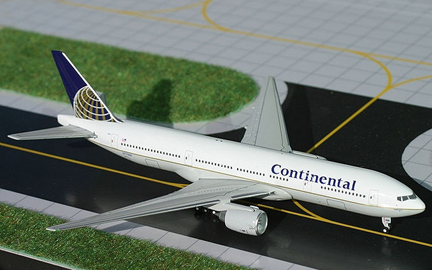 Gemini Jets Model: one limited edition, collectible die cast airliner model in 1/400 scale. All construction is made of metal, of an Hawker Siddley HS-121 Trident 2E in the CAAC - Chinese National Airlines Current Colors. Airframe Registration, B-2217. This models is available as October, 2007. 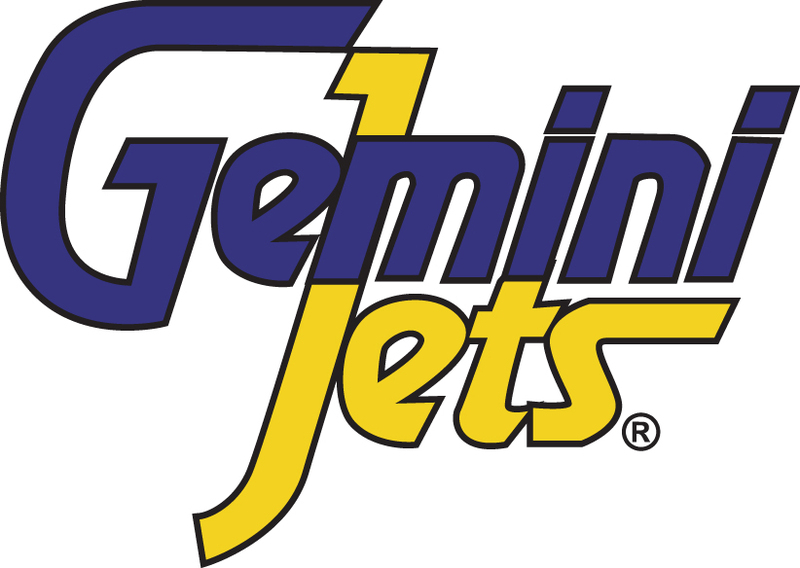 Gemini Jets Model: one limited edition, collectible die cast airliner model in 1/400 scale. All construction is made of metal, of an Hawker Siddeley Trident 1E in the Channel Airways UK Old Colors. Airframe Registration, G-AVYB. This models is available as September, 2007. 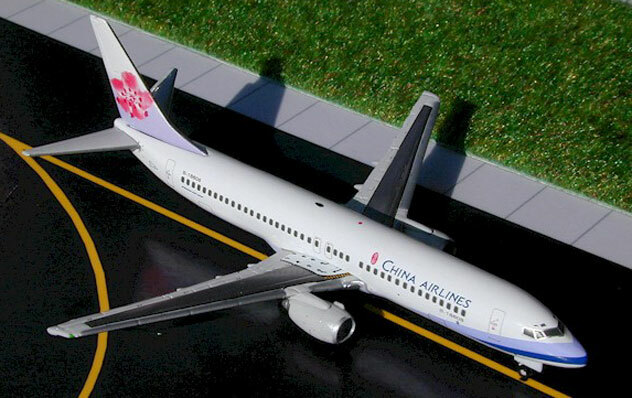 Gemini Jets Models: one limited edition collectable, die-cast metal airliner model in a 1/400th scale of a Boeing B737-809 in the China Airlines Current Color Scheme. Airframe Registration B-18608. This model is constructed of die-cast metal with some plastic parts. This product is available beginning in May 2001. 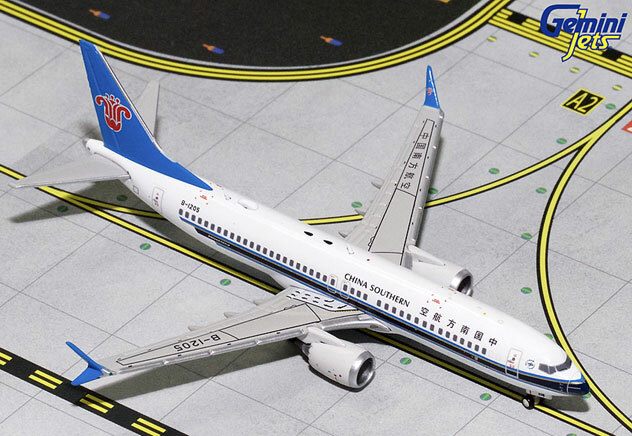 Gemini Jets Models: one limited edition collectible, die cast airliner model, in a 1/400th scale of a Boeing B737-8Max in the China Southern Airlines Current Delivery Colors Scheme. Airframe Registration B-1205. The model is constructed of metal with some plastic parts. This product was released in July, 2018. 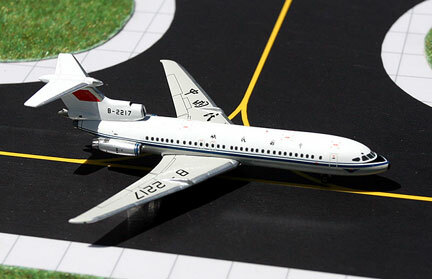 Gemini Jets Models: one limited edition collectable, die-cast metal airliner model in a 1/400th scale of an Embraer ERJ-190 in the China Southern Airlines Current Color Scheme. Airframe Registration B-3148. This model is constructed of die-cast metal with some plastic parts. This product is available beginning in August 2016. Gemini Jets Models: one limited edition collectable, die-cast metal airliner model in a 1/400th scale of a McDonnell Douglas DC-10-30 in the Condor Airlines Old 1980s Colors Scheme. With a Chrome Metal finish. Airframe Registration D-ADQO. This model is constructed of die-cast metal with some plastic parts. This product is available beginning in July 2002. Gemini Jets Models: one limited edition collectable, die-cast airliner model in a 1/400th scale of a Boeing B747-312 in the Corsair Airlines �Sun� Color Scheme. Airframe Registration F-GSUN. This model is constructed of die-cast metal with some plastic parts. This product is available beginning in March, 2003. 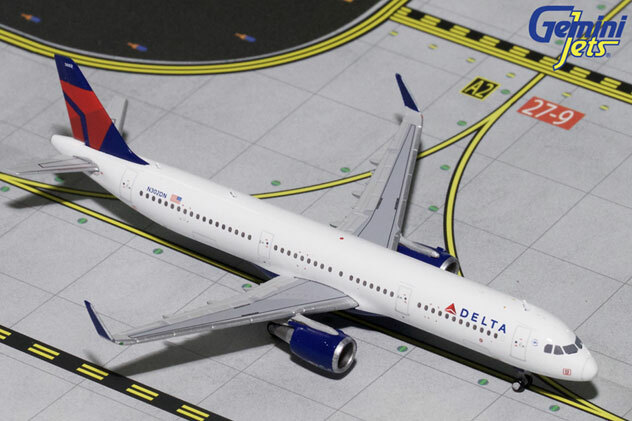 Gemini Jets Models: one limited edition collectable, die-cast metal airliner model in a 1/400th scale of an Airbus A321-211Neo in the Delta Airlines Current Onward & Upwards Colors Scheme. Airframe Registration N302DN. This model is constructed of die-cast metal with some plastic parts. This product is available beginning in January 2018. 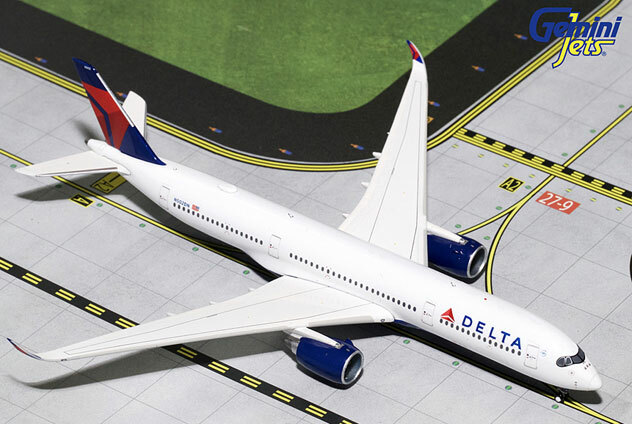 Gemini Jets Models: one limited edition collectable, die-cast metal airliner model in a 1/400 scale of an Airbus A350-941 in the Delta Airlines the current Onward and Upwards Colors Scheme. Airframe Registration N502DN. This model is constructed of die-cast metal with some plastic parts. This product is available beginning in March 2018.